James Reimer (/ˈraɪmər/; born March 15, 1988) is a Canadian professional ice hockey goaltender currently playing for the Florida Panthers of the National Hockey League (NHL). Reimer has also played in the NHL for the Toronto Maple Leafs and San Jose Sharks. He was selected by the Maple Leafs in the fourth round (99th overall) of the 2006 NHL Entry Draft. He started playing minor hockey in his hometown when he was 12. He played junior hockey with the Red Deer Rebels of the Western Hockey League (WHL), after being selected in the fifth round of the 2003 WHL Bantam Draft. 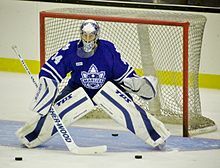 After turning professional, Reimer played with the South Carolina Stingrays and Reading Royals of the ECHL, as well as the Toronto Marlies of the American Hockey League (AHL). He was named the most valuable player of the ECHL playoffs, as the Stingrays won the Kelly Cup in 2009. Reimer made his NHL debut with the Maple Leafs during the 2010–11 season and went on to replace Jean-Sébastien Giguère as the Maple Leafs' starting goaltender. Reimer plays for Canada internationally, and first represented his country at the 2011 World Championship. In 2013, he had the best save percentage in Toronto Maple Leafs history with a then .918. Reimer started playing goalie when his older brother, Mark, needed practice shooting but had no goalie. A local minor hockey manager heard about his prowess in goal, and recruited him. His parents were unsure if minor hockey was the right fit for their son, so he did not play organized hockey until he was 12. He was first noticed by agent Ray Petkau when he was 13, after playing with a church team at a tournament in Steinbach, Manitoba. As of November 2011, Petkau was still his representative. Reimer was selected by the Red Deer Rebels in the fifth round of the 2003 Western Hockey League (WHL) Bantam Draft, with a pick that originally belonged to the Spokane Chiefs. The team drafted Reimer largely on the word of a single scout, Carter Sears. After Reimer performed poorly during his first training camp with the club, Rebels head coach Brent Sutter wanted to release him, but Sears was persistent in his support for Reimer. Reimer made the club in his third attempt after having been cut the previous two seasons. His first season in the WHL was a poor one for the Rebels; Reimer played 34 games, recording only 7 wins. Reimer broke his hand late in the season, an injury which cost him a chance to play for Canada at the 2006 IIHF World U18 Championships. Reimer was selected by the Toronto Maple Leafs in the fourth round, 99th overall, of the 2006 NHL Entry Draft. John Ferguson, Jr., the Maple Leafs' general manager at the time, remembers Reimer as an unfinished product needing time to develop, being "somewhat raw". At the time of the draft, Reimer was preparing for his high school graduation and did not attend the event in Vancouver. He said, "I made a decision not to pay a lot of attention because I was reluctant to get my hopes too high." His agent, Ray Petkau, called with the news about being drafted and later brought him his Maple Leafs jersey and hat that draftees receive. Prior to the draft, Reimer had mentioned he would like to be drafted by the Los Angeles Kings, saying, "I'd love to play hockey in all that sunshine." Reimer attended training camp with the Maple Leafs in 2006 and 2007, but was returned to the Rebels both times. During the 2006–07 WHL season, he played in 60 games with the Rebels, recording 26 wins, 23 losses and 7 ties, the only season in his WHL career Reimer finished with a winning record. The 2007–08 WHL season was Reimer's final season in the WHL. He suffered a torn ligament in his ankle and only appeared in 30 games. In March 2008, the Maple Leafs signed Reimer to a three-year contract worth an annual base salary of $555,000, the minimum for an NHL player at the time. The deal included a $180,000 signing bonus and playing incentives that could increase the total value of the contract to $1.8 million. After attending the Maple Leafs' training camp in September 2008, Reimer was assigned to the Toronto Marlies of the American Hockey League (AHL). After starting the season with the Marlies, he was assigned to the Reading Royals of the ECHL. He was recalled by the Marlies and recorded his first AHL win by a score of 3–2 in a shootout on December 27, 2008, against the Manitoba Moose. In two stints with the Marlies, Reimer had a record of one win and two losses, with a goals against average (GAA) of 3.28 and a .882 save percentage. With the Royals, Reimer had a record of ten wins, seven losses and three ties. At the ECHL trade deadline, Reimer was moved to the South Carolina Stingrays, a team that had gone through eight goaltenders during the season. The deal was facilitated to expose Reimer to post-season experience, as the Royals were out of playoff contention. 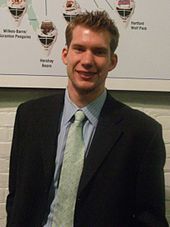 While with the Stingrays, Reimer helped them win the 2009 Kelly Cup championship. Recording four wins and one shutout over eight games in the post-season, he was named the ECHL Playoffs Most Valuable Player. Reimer at Ricoh Coliseum after a Toronto Marlies hockey game on December 11, 2009. After attending the Maple Leafs' training camp ahead of the 2009–10 NHL season, Reimer was again sent down to the AHL. As part of the Marlies' pre-season, Reimer competed in the Gardiner Cup, held as part of Scotland's 2009 Homecoming celebrations. He stopped 33 shots in the final as the Marlies lost 3–1 to the Hamilton Bulldogs. Back in the AHL, he spent the majority of the 2009–10 season with the Marlies, playing in 26 games and recording 14 wins. He had a GAA of 2.25 and a save percentage of .925. Reimer was called up by the Leafs on an emergency basis on October 13, 2009, when starting goaltender Vesa Toskala was injured. Serving as Joey MacDonald's backup, he did not receive any playing time in his first NHL call-up and was sent back to the Marlies on October 25. Reimer missed significant time with an ankle injury during the 2009–10 season. It was not the same ankle he injured during his final season with the Red Deer Rebels. Reimer became a quick fan favourite during his rookie NHL season, earning the nicknames "Optimus Reim" and "The Statue". The former is a reference to the Transformers protagonist Optimus Prime, while the latter resulted from head coach Wilson's attempts to suppress the hype around the rookie goalie only a short time into his NHL career, saying, "There's all this [attention] around here, a guy wins a game and we're ready to build a statue for him." Reimer's strong performance was recognized by the NHL when he was named Rookie of the Month for March 2011. Reimer would have become a restricted free agent on July 1, 2011, but he signed a three-year contract worth $5.4 million ($1.8 million salary cap hit) on June 9, 2011. Reimer began the 2011–12 season as the starter going 4–0–1. He suffered an injury on October 22 in a game against the Montreal Canadiens. During the game, Reimer was run into by Brian Gionta—he finished the first period, but did not return after the intermission. The team called the injury whiplash despite rumours that he was suffering from a concussion. Reimer missed 19 games with the injury, and struggled upon his return, yielding some starts to Gustavsson. After recording two back-to-back shutouts on February 1 and February 4, Reimer seemed to have solidified the starting position once again. Near the end of March 2012, Reimer was starting to play to an acceptable standard again, but an upper-body injury (later revealed to be a neck injury) sidelined him for the remainder of the season from March 29. On April 9, he told the media he would be available by training camp in September 2012. Due to the 2012–13 NHL lockout, Reimer was afforded more time to heal and attended training camp in January 2013. Reimer held off an early challenge from rookie backup Ben Scrivens to remain Toronto's starting goaltender. On February 11, Reimer suffered a MCL strain which kept him out of action for a little over two weeks; he won all three of his next starts after returning. Upon returning, Reimer backstopped the Maple Leafs to their first playoff berth since 2004 and finishing the regular season with a career best 2.46 GAA and .924 save percentage in 34 games. Prior to the 2013–14 season, the club acquired Jonathan Bernier from the Los Angeles Kings. At the beginning of the season, Reimer and Bernier were splitting time in the Toronto goal, but as the season progressed, Bernier cemented his status as the Leafs' starting goaltender. Following the 2013–14 season, Reimer became a restricted free agent. Dissatisfied with his role as the Leafs' backup, he requested a trade from the Leafs. On July 25, 2014, the Leafs and Reimer avoided a salary arbitration hearing scheduled for the next week by agreeing to terms on a two-year contract with an average annual value of $2.3 million. Reimer began the 2015–16 season as Bernier's backup, a role he had held since the team acquired the latter. However, Bernier was injured early in the season and Reimer was given starting duties. He took off with the job, going 3–0–0 with a 1.62 GAA and .952 save percentage to be named the third star for the week of November 9–15, 2015. Reimer would hold the position as Maple Leafs' starting goaltender for the rest of his tenure, earning praise for his play on a Toronto team that struggled throughout the year. As the February 29 trade deadline approached, Reimer's future with the rebuilding Maple Leafs became uncertain. 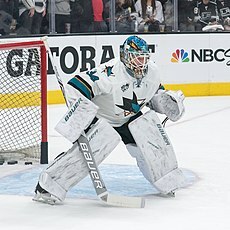 On February 27, 2016, two days before the deadline, Reimer was traded to the San Jose Sharks (alongside Jeremy Morin) in exchange for Alex Stalock, Ben Smith and a conditional fourth-round pick in the 2018 NHL Entry Draft (condition dependent on the Sharks reaching the Stanley Cup Finals, a condition met, converting the pick to a third-round pick on May 25, 2016). Reimer had the best five-on-five save percentage and the best Fenwick save percentage in the NHL for the 2015–16 season (1,200 minutes minimum time on ice) at .9404 and .9573 respectively. On July 1, 2016, as a free agent for the first time in his career, Reimer was signed to a five-year contract with the Florida Panthers. Reimer's first brush with international hockey came near the end of the 2005–06 season. He was selected to play for Team Canada at the 2006 IIHF World U18 Championships, but was unable to compete due to a broken hand he suffered while playing for Red Deer. After his strong rookie season in the NHL, Reimer received another invitation from Hockey Canada, this time to compete at the 2011 IIHF World Championship. Reimer got his first win in the tournament beating Belarus 4–1. Reimer plays in the butterfly style of goaltending. Observers have attributed Reimer's success during the 2010–11 season to his ability to maintain his focus and confidence. Reimer tries to focus on the basics of playing goal, feeling that the fundamentals of goaltending are the key to success, saying, "It's not about making the great save, or making a diving save or playing outside yourself. It's all about pushing, stopping, and being square and just relying on that. Most of the time if you let out a rebound the defenceman is there so it's more about being solid fundamentally." Reimer was born in Arborg, Manitoba, to parents Harold and Marlene Reimer. His father owns a business moving homes. He graduated from Morweena Christian High School in his hometown. His favorite hockey team growing up was the Toronto Maple Leafs and his favourite player was Ed Belfour. Reimer met his wife, April, at a junior hockey game in Moose Jaw, Saskatchewan. The couple have two daughters who were born in 2017 and 2019 in Fort Lauderdale, Florida. Reimer is a practising Christian, giving credit to God as a big part of his mental game. ^ "Toronto Maple Leafs Career Leaders". Hockey-Reference.com. Retrieved 2013-10-05. ^ a b Ulmer, Mike. "Ulmer On Rising Star James Reimer". Toronto Maple Leafs. Retrieved 2011-03-04. ^ a b c d Mirtle, James (2011-02-04). "The 'miracle' from 'the middle of nowhere'". The Globe and Mail. Toronto. Retrieved 2011-03-04. ^ a b c d e "Toronto Maple Leafs pick young Arborg goalie in NHL draft". The Interlake Spectator. Retrieved 2011-03-04. ^ "Interlake Lightning Awards & Honours". Interlake Lightning. Retrieved 2011-03-04. ^ "2003 WHL Bantam Draft: Round 5". Western Hockey League. Archived from the original on 2011-07-06. Retrieved 2011-03-04. ^ "Reimer off to Red Deer". The Interlake Spectator. Retrieved 2011-03-04. ^ a b c d e f "James Reimer". The Internet Hockey Database. Retrieved 2011-03-04. ^ a b c "Broken hand ends banner season for Arborg goalie". The Interlake Spectator. ^ "James Reimer". Toronto Maple Leafs. Retrieved 2011-03-04. ^ a b c "James Reimer". The Sports Network. Retrieved 2011-03-04. ^ "Q&A with James Reimer". Hockey's Future. Retrieved 2011-03-04. ^ "James Reimer prepares for life in pro hockey". The Interlake Spectator. Retrieved 2011-03-04. ^ "Marlies get past Moose in Shootout". The Sports Network. 2008-12-27. Retrieved 2011-03-04. ^ a b c Dhanoa, Aman (2010-04-02). "James Reimer is Turning Heads in His First AHL Season". Oye! Times. Retrieved 2011-03-04. ^ "Marlies drop final". The Toronto Sun. 2009-09-28. Archived from the original on 2009-10-01. Retrieved 2011-03-04. ^ Hunter, Paul (2009-09-13). "Lousy leafs shake things up". The Toronto Star. Retrieved 2011-03-04. ^ a b Mirtle, James (2011-03-02). "Is James Reimer the real deal?". The Globe and Mail. Toronto. Retrieved 2011-03-04. ^ "Reimer Becomes 456th ECHL Player to Reach NHL". ECHL. 2010-12-21. Retrieved 2011-03-04. ^ "Maple Leafs vs. Senators". Ottawa Senators. Archived from the original on 2011-03-10. Retrieved 2011-03-04. ^ Zwolinski, Mark (3 February 2011). "Reimer gets first NHL shutout as gutsy Leafs blow past Hurricanes". Toronto Star. Retrieved 4 February 2011. ^ "Leafs' teammates not surprised that Reimer has been recalled". The Sports Network. 2011-01-23. Retrieved 2011-03-04. ^ Mirtle, James (2011-03-01). "James Reimer ready to return". The Globe and Mail. Toronto. Retrieved 2011-03-04. ^ "Leafs goalie Reimer still getting used to life in the NHL". The Sports Network. 2011-02-22. Retrieved 2011-03-04. ^ Mirtle, James (2011-02-03). "Wilson tries to keep a lid on Reimer hype". The Globe and Mail. Toronto. Retrieved 2011-03-04. ^ Hornby, Lance (2011-04-01). "Reimer nets rookie of the month honours". The Toronto Sun. Retrieved 2011-04-01. ^ "Maple Leafs sign goaltender Reimer to three-year contract". The Sports Network. 2011-06-09. Retrieved 2011-06-09. ^ a b "Maple Leafs G Reimer returns Saturday". Fox News. 2011-11-27. Retrieved 2012-01-29. ^ Mirtle, James (2011-11-27). "Reimer out but Leafs say it's not a concussion". Toronto: The Globe and Mail. Retrieved 2012-01-29. ^ Traikos, Michael (2012-01-12). "On and off the ice, Leafs' Jonas Gustavsson has shown a quiet ferocity". National Post. Archived from the original on 2012-01-10. Retrieved 2012-01-29. ^ Zwolinski, Mark (2012-02-07). "Toronto Maple Leafs goalie James Reimer made huge stops in win over Edmonton Oilers". The Star. Toronto. ^ "James Reimer has neck injury, not concussion". CBC News. 2012-04-09. ^ Mitchell, Bob (2013-02-12). "Maple Leafs goalie James Reimer out at least a week with knee injury". The Star. ^ "James Reimer Toronto Maple Leafs - 2013-2014 Stats - Toronto Maple Leafs - Team". Mapleleafs.nhl.com. Retrieved 2013-10-05. ^ Hilson, Dave (January 29, 2014). "Maple Leafs' Bernier has No. 1 role virtually locked down". Toronto Sun. Retrieved July 25, 2014. ^ "Reimer requests to be traded from Maple Leafs". Sportsnet. Retrieved July 25, 2014. ^ "Leafs and Reimer receive two-year deal and avoid arbitration". TSN. Retrieved July 25, 2014. ^ "Duchene, Zuccarello and Reimer named stars of week". NHL. Retrieved November 16, 2015. ^ "Maple Leafs trade goaltender James Reimer to Sharks". Sportsnet. Retrieved February 27, 2016. ^ "Sharks win Game 6, reach first Stanley Cup Final". May 26, 2016. Retrieved February 27, 2016. ^ "Puckalytics.com Goalie Statistics", Retrieved 2016-07-11. ^ "Florida Panthers sign Goalie James Reimer to 5-year contract". Florida Panthers. 2016-07-01. Retrieved 2016-07-01. ^ "Canada defeats Belarus in world championship opener". Tsn.ca. 2011-04-29. Retrieved 2013-10-05. ^ Zwolnski, Mark (2011-03-21). "Reimer not just a steady hand – he's giving Leafs an edge". The Toronto Star. Retrieved 2011-03-26. ^ Woodley, Kevin (2011-01-15). "Leafs Reimer affirms Allaire changes with NHL success". In Goal Magazine. Retrieved 2011-03-04. ^ Stubbs, Dave (2011-02-25). "Reimer tabbed to life Leafs into postseason". Montreal Gazette. Archived from the original on March 1, 2011. Retrieved 2011-03-04. ^ Sibley, Kailey (January 31, 2017). "James and April Reimer welcome a baby girl". sportsnet.ca. Retrieved September 30, 2018. ^ Hutchison, David (April 5, 2011). "OPTIMUS MEETS JESUS ON JAMES REIMER FANS-AND-FAITH MASK". ingoalmag.com. Retrieved September 30, 2018. ^ Mirtle, James (April 3, 2011). "James Reimer has faith in his game". The Globe and Mail. Retrieved September 30, 2018. This page was last edited on 20 April 2019, at 00:56 (UTC).